Personalised bath sheets in sumptuous cocoa brown, a unique and useful gift. 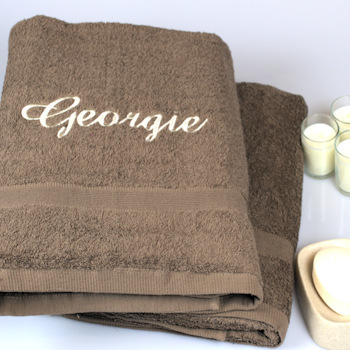 Personalised bath sheets in sumptuous cocoa brown, a unique and useful gift. Treat a special person or a couple to a unique gift. Popular for wedding and honeymoon gifts, anniversary gifts and even a great housewarming gift. Personalised bath sheets in sumptuous cocoa brown, a unique and useful gift. Treat a special person or a couple to a unique gift. Popular for wedding and honeymoon gifts, anniversary gifts and even a great housewarming gift. Extremely stylish personalised towel gift set in chic new coordinating colours great for on the beach or in the bathroom! You can fill in the options and have these towels made extra special - these can be personalised with your choice of text, including His and Hers, Husband and Wife, Your and Mine, His Lordship, Her Ladyship, or the couples names embroidered or initials monogrammed on each in your choice of lettering style we used alternating thread colours in fancy script lettering our example! Please enter the exact wording you would like embroidered. This personalised towels gift set comprises of 2 cocoa brown bath sheet size towels (143cm x 93cm approx) that are very soft and a unique gift set! Please note: At Amys Gifts produce our own embroidery to order and do our best to get all orders dispatched within approx 48 hours.